Jharkhand Staff Selection Commission had postponed the main examination for constable (Aarakshi) posts which is scheduled to be held on 17 July 2016. In a latest notice released by JSSC at official website www.jssc.in, With immediate effect, JSSC had postponed the exam. 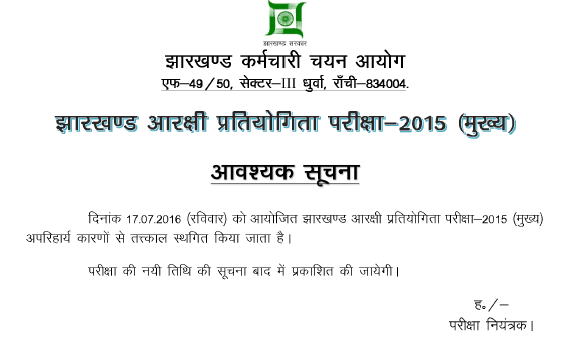 New exam date will be declared in upcoming days. You are required to be in touch with official site jssc.in or our website to stay updated with latest news regarding this recruitment.